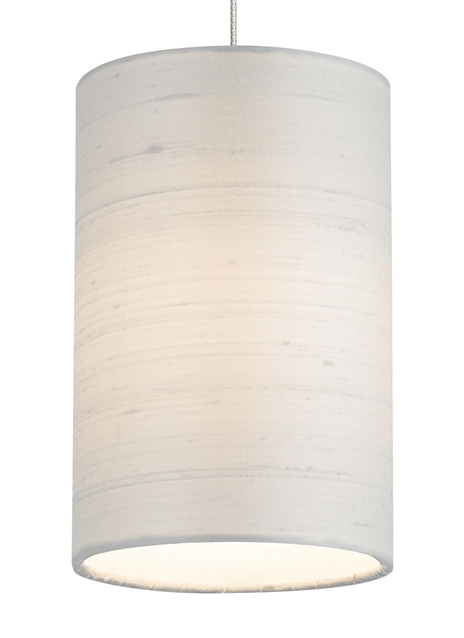 The Fab pendant by Tech Lighting is soft and beautiful to the eye with its Indian silk made shade. The Fab pendant features a cylinder shaped shade that has been hand-rolled to artfully and gently diffuse the light within. The Fab is available in two contemporary colors, Almond and White, both colors will beautifully accent the space that surrounds it. Scaling at 8.4” in length and 5.2” in width makes the Fab pendant ideal for dining room lighting, kitchen island task lighting and bedroom lighting flanking two end tables. The Fab ships with your choice of energy efficient halogen or LED lamping, both options are fully dimmable to create the desired ambiance. Pair the Fab pendant with the Monorail system by Tech Lighting for greater design customization.